Kids love to get dressed up and Halloween is an ideal time. These days, lots of shops such as supermarkets and toy stores sell costumes. However, it’s more fun, more creative and often cheaper to make your own. Often you can put together a costume for kids from clothes and accessories they already have around the house. 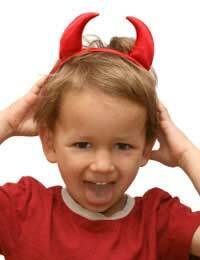 Little devil costumes are quite easy to put together with any red clothing that your child has in the house, such as T-shirts, tracksuit bottoms and even pyjamas. What really makes the costume work though is devil horns and a tail. Step one: Draw a devil horn shape onto your pattern paper. You can create this freestyle or perhaps look for print-and-cut templates online. Step two: Cut out the template. Step three: Fold your red felt in half and pin the template on. Step four: Cut out two of the shapes, then repeat so that you have four horn-shaped pieces of red felt. Step five: Decorate two of the felt pieces in any way you like to make them look more devilish. Use sequins, glitter or whatever you have lying around. Step six: In the pairs, lay one horn shape on top of the other with the decoration facing inwards. Step seven: Stitch the horns together, leaving one end open. Then, turn the horns the right way out. Step eight: Stuff the horns well with cotton wool or whatever stuffing you’re using. Step nine: Turn the bottom edges inwards and hand-stitch closed. Step ten: Stitch the horns either onto a fabric-covered headband (velvet ones work well) or onto two separate hair slides which you can then add into the hair. All you need now is face paints to complete your outfit! Step one: Lay the tail strip along the floor and place a line of stuffing/cotton wool all the way down the middle. Step two: Fold the strip in half and pin. Step three: Sew the tail closed along the length, as well as at both ends. Step four: Sew or glue a piece of triangular red felt to the end of the tail. Step five: Attach the tail to tights or trousers with glue or stitches.